Naturally, a lawsuit against the store’s parent company followed. Can you guess the outcome of this security lawsuit based on facts and circumstances? In the ten years before Brown was shot, six shootings and 126 robberies had occurred at the store and other area stores. The store’s cash wasn’t regularly removed to a bank and accumulated in the store’s safe. Store employees could open the safe, rather than using a drop safe that could only be opened by armed security personnel during cash pickups. The parking lot was too dark. The store had retail security procedures that were more stringent than those of other convenience stores in the area. Cash pickups were arranged so that the store’s employees would not have to risk leaving the premises with large amounts of cash. The store’s parking lot was well lighted. Because it provided this level of security, the guard’s assailant was entirely liable for the shooting and Brown’s injuries, according to the store’s defense attorneys. So what do you think? There was certainly some he-said/she-said in the case with respect to perspectives on the parking lot lighting. However, keeping too much cash on hand is a well-established contributor to store robberies. Does it sound like the store was found liable for the guard’s injuries? If so, what do you guess was the amount of the damage award? A store robbery is a tragic event, but it typically involves relatively small monetary losses. The average loss in a convenience store robbery was $699 in 2014, for example. Some crime prevention analysts think it is possible that retailers can lose sight of their significance because of the small dollar amounts involved. However, unlike other crimes that may have a greater impact on the bottom line, robbery puts employees in physical danger, which requires management to move it ahead of others on the risk scale. In addition to the potential of a million-dollar judgment, there are other reasons robbery prevention makes fiscal sense. Medical payment, when crime is the cause of a worker’s injury, averages nearly $14,000. Only burns and motor vehicle accidents result in higher medical payouts, according to the National Council on Compensation Insurance. 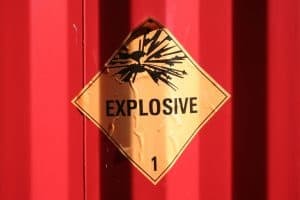 Including lost work time, legal expenses, and other costs, some industry estimates are that the average cost to employers of a single episode of workplace violence can cost between $25,000 and $250,000. Curtailing available cash is critical in high-risk locations, according to legal experts. During evening and late night hours of operation, cash levels should be kept to a minimal amount per cash register to conduct business. Transactions with large bills over $20 should be prohibited. Stores should also limit use of solitary workers, especially at high-risk stores during high-risk times, experts advise. Security Lawsuit = Legal Landmine? Legal exposure is amplified for retailers because of the need to have store associates control members of the public. It is a difficult issue made trickier because it can be challenging to find a balance between loss/crime prevention and security lawsuit prevention. Retailers must develop strategies to prevent theft or else thieves will eat into profits; yet, in a specific incident, a business stands to lose much more in a lawsuit than from a thief or shoplifter. In the retail sector, which bears the brunt of security lawsuits, companies risk million-dollar lawsuits because they don’t put sufficient resources toward training retail security guards and ensuring they are adequately supervised, according to security consultant John Christman, CPP, former vice-president and director of security for Macy’s West. Do we warn loss prevention staff and employees who perform security functions not to enlist members of the public in apprehending or subduing a suspect? The case: An employee at a major big-box retailer confronted a suspected shoplifter and a physical altercation ensued, during which the worker called out for assistance from store patrons standing nearby. The suspect then stabbed one shopper who came to the worker’s aid. Afterwards, the shopper sued the store, claiming that it had failed to protect him. Because businesses have an obligation to protect patrons from a crime they know is occurring or about to occur, the 10th Circuit Court of Appeals ruled to allow the victim to pursue his claim against the retailer. Do we focus on training security officers to stop shoppers only when they are confident that they have committed a crime? Failure to prove a charge of shoplifting leads to the majority of lawsuits against retailers, according to a review of 235 lawsuits by researchers at Pennsylvania State University. The case: A manager at a Charleston, SC, children’s toy store watched a woman put cookies in her tote bag while shopping and arrested her as she exited the store. However, it turned out that the Russian woman had paid for the merchandise and had only placed it in her tote temporarily, something not uncommon in her native country, according to published reports. A jury ordered the retailer to pay the woman $1.2 million. Note: The second leading cause of claims against retailers is “arrestee subjected to mistreatment during investigation,” according to the study. This post was originally published in 2017 and was updated October 17, 2018.